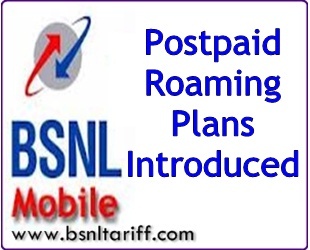 Leading-State Run Telecom Operator in India Bharat Sanchar Nigam Limited (BSNL) has introduced new Fixed Monthly Rental (FMC) Roaming plans under GSM Postpaid Mobile Services across Karnataka Telecom Circle. The Competent Authority of Karnataka Circle has launched new Roaming FMC Plans of GSM Postpaid, Plan-145, Plan-149, Plan-625 and Plan-825 with NIL Registration Amount. The above FMC Postpaid plans will be implemented across Karnataka Telecom Circle with effect from 24-08-2013.